The wedding ring quilt, or double wedding ring, was a popular design in the United States during the 1930s. These quilts use small pieces of fabric, and create very little waste. They were often made and given as wedding gifts. Because of the curves involved, this is not a project for a beginning quilter. 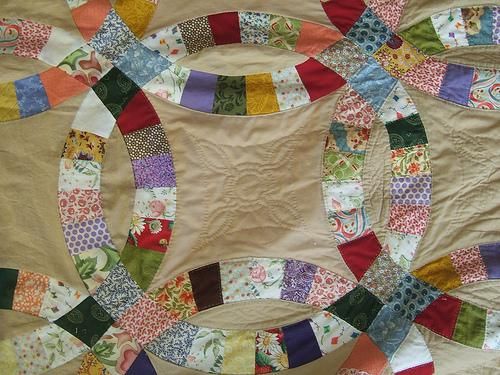 A wedding ring quilt is made of intertwining circles, constructed using small pieces of fabric, with a solid background and contrasting corner connections. Small scale prints work best for the circles with solid, contrasting colors for the background and corner connections. You can either use light colors for the rings and dark for the background or vice versa, but be sure to maintain a contrast or the design will be difficult to see. Accuracy is crucial to quilting. All of the pieces must be the correct shape and size in order for the quilt to come together properly. Using a template makes cutting the pieces of a wedding ring quilt much easier, and transparent templates with non-slip buttons attached to the bottoms are just the ticket. The templates include a ¼ inch seam allowance, so you can lay each piece down on a stack of pre-cut strips of fabric and cut them with a small rotary cutter. When cutting the fabric, do not include the selvage edges. As you cut your pieces, you can arrange them on a flannel board to be sure that they will fit together correctly. This is a board covered with flannel material that the cloth pieces will stick to on their own. This allows you to piece sections together and make changes before cutting out the entire wedding ring quilt. Sew the completed melons to the background pieces, pressing the seams as you go. Sew the connecting pieces last. This will enable you to adjust any differences in seam allowance if you need to. After top is completed, use another template to transfer a quilting design to the fabric with a quilter’s pencil. Heart designs are popular for wedding ring quilts. Sandwich a layer of batting between top and bottom fabric, and baste the three layers together. The quilt can be sewn by machine or by hand. Once the quilting is complete, sew binding around the outside edge of the wedding ring quilt to finish it off.